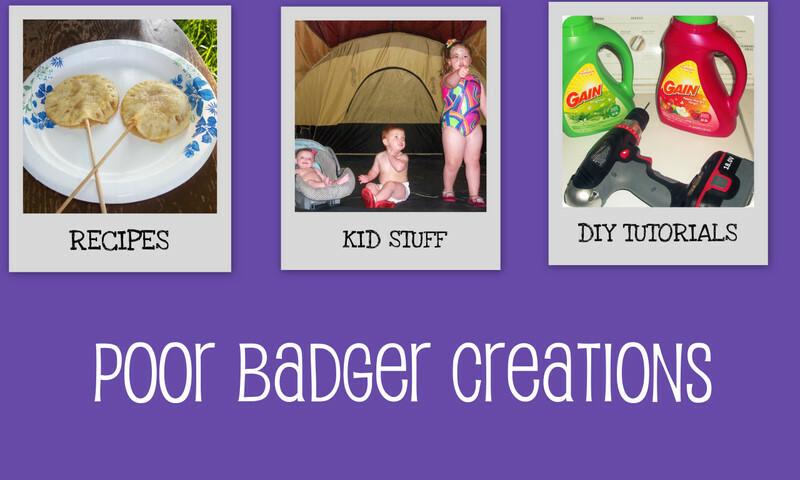 Poor Badger Creations: How to make your own family table out of an old door. How to make your own family table out of an old door. The first thing you need is a door. I recommend you using wood only, a metal door would be very heavy and my carpentry skills are not good enough to tell you how to secure it. I also recommend you putting the word out to friends, family, and co-workers to get your door. The whole point of up-cycling is to reuse trash and create less waste. Craigslist is also a great place to find a door. Be patient, if you do the right looking you can get this for free and help someone else get rid of junk. We are using plexi-glass on top of our table, if you want to spend the money you can easily go to a glass shop and buy a custom piece. I priced them at our local shop for $150. We have three badgers under three years old at home and glass scares me. At Lowe's they had a sheet of plexi-glass the perfect fit, except for a few inches. If you go the plexi-glass route you will need to measure and if the door is too small some minor sawing is needed. 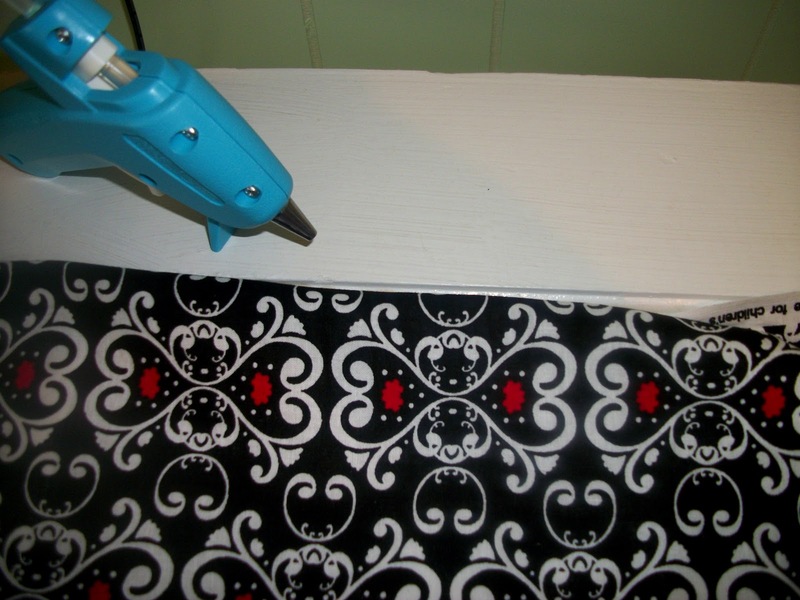 Now if your door has cut outs/inserts like our does, here is your chance to get crafty. 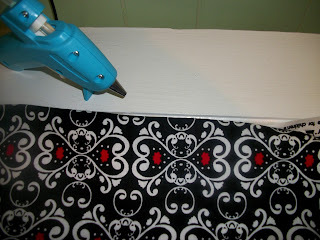 You can leave it plain, paint it another color, use scrap booking paper to decorate (just use Elmer's glue to glue paper down), or you can use fabric. I found this fabric for $6.50 a yard at Wal-Mart, you only need one yard (I bought two, the other yard is going to be a skirt). Like I said before, this is your chance to be as creative as you want to be. If you are using fabric, you can just hot glue it down. Just flip the ends in, so it will look more finished. Nows the time to add the plexi-glass. Some MAJOR tips before you start with the plexi-glass. It comes with a protective sticker, leave it on until the very last minute! 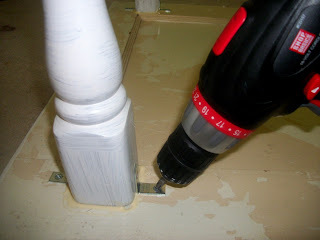 When drilling plex-glass you HAVE to drill pilot holes. It will crack if you don't. When drilling the pilot holes use a drill bit designed for metal or glass and you need to put a piece of tape over the area where you intend to drill (at this point the protective sticker is still on). 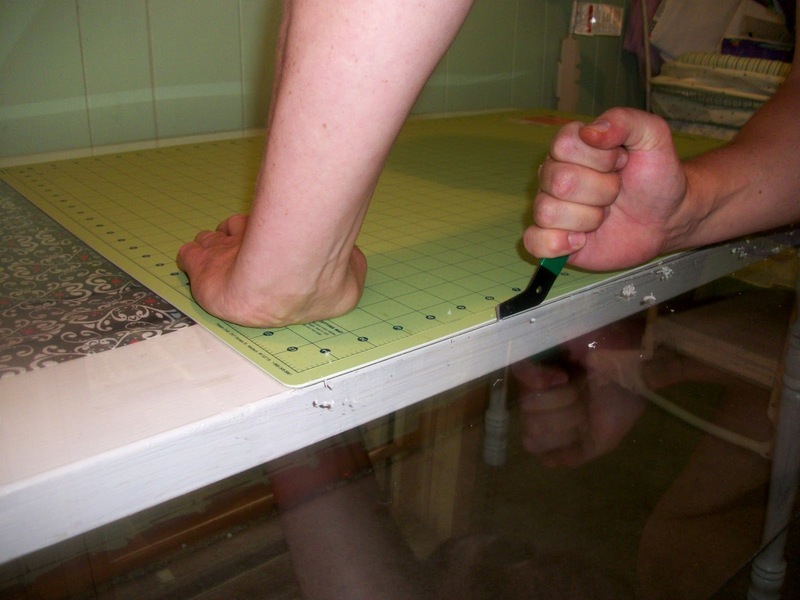 So lay the plexi-glass on the table with sticker on, mark the areas you want to drill with tape, use a drill bit for metal/glass, and drill SLOW. If you go crazy it will crack! After you drill the pilot hole, remove the protective sticker. You can now secure the plexi-glass to the door with a screw. Easy! Now the plexi-glass we bought was two inches too short length wise and we had to shorten the door. Well the plexi-glass was too big width wise. So if you run into this problem here is what you do: SCORE! Get you a really sharp utility knife and score it many times where you want to cut it. We scored it 25 times. 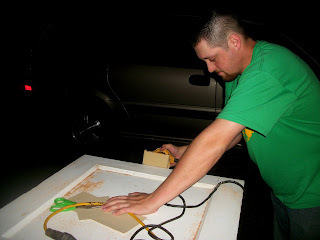 Then with the help of someone evenly place your hands on the plexi-glass and snap it. It is good to have the glass against something sturdy and flat when you do this, that is why we screwed it to the table before we cutted the plexi-glass. And you are done! If the corners are too sharp you can use a polishing bit and your drill to dull the ends, but other than that you have a handmade table! This was Poor Badgers first blog of many. I just want to help others know you two can make it with a little time and effort. Hope you enjoy your door as much as our family is enjoying it! 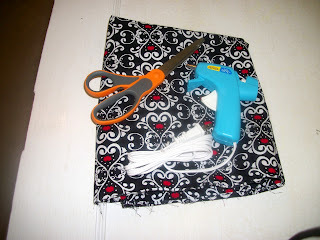 You can find us on facebook for more crafts and tons of pictures! Excellent. Now try doing it with everything re-cycled. It feels even better. Hi to every body, it's my first visit of this webpage; this blog includes amazing and in fact fine material in support of readers. I'm happy to search out numerous useful info here within the submit, we'd like work out more strategies on this regard, thanks for sharing. What's up to every one, the contents existing at this web page are really awesome for people experience, well, keep up the good work fellows. that it's really informative. I am going to watch out for brussels. I will appreciate if you continue this in future. A lot of people will be benefited from your writing. Cheers! I've discovered so far. However, what in regards to the bottom line? website accidentally, and I am shocked why this coincidence did not took place in advance! might probably be longer. ' Helps lift depression, prevent depressive thoughts. likelihood of the development of psychosis. notice this. You should continue your writing. I'm confident, you've a huge readers' base already!